Junior Marvin, singer songwriter and virtuoso lead guitarist from Bob Marley and the wailers fame has a single out on Jambila Music. The legendary Jamaican born guitarist and singer previously had his own band ‘Hanson’ in the early 70’s before Joining Bob Marley and the Wailers in 1977. “Exodus” was his first album with them which was voted “Best album of the 20th Century” by Time magazine and he is on all of Bob Marley and the Wailers albums post ‘Exodus’. 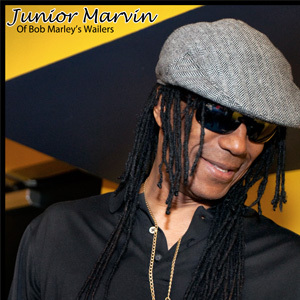 Junior became lead singer of the Wailers after Bob Marley’s untimely death in 1981 and released four albums with them “ID”, “Majestic Warriors”, “Jah Message” and “My Friends”. In 2007 Junior released his solo album ‘”Wailin for Love” and has a new solo album set for release in 2012, Junior has also featured on albums by Burning Spear, Toots and the Maytals, Alpha Blondy, Bunny Wailer, Israel Vibrations and Beres Hammond among others.